The climate of Alcala is the continentalised Mediterranean. It means cold, dry winters and hot, dry summers. Rains fall mainly in spring and autumn. Snow falls occasionally. Temperatures vary from some degrees below 0 °C in December and January, to some over 40 °C in July and August. The average temperature is about 15ºC. Do you know how we recognize you? You may wear socks with sandals during the summer, but what really impress us is you wearing just a little T-shirt when it is still freezing cold. We only take out our coat when it is actually hot: a small ray of sun during the winter is not enough. Like most people when they first move to Spain, you may find it tricky to adapt to our timetable. We do everything one or two hours later than you are used to. Sorry. School hours: from around 8:30 to 2:30. Long working hours, from 7-9 am to 6-8 pm. Long break (3-4 hours long) in the middle of the day: most businesses close and the streets are not very busy, especially during the summer. Some people think punctual means being around 15-30 minutes late. Sorry again. The main mean of transportation in Alcala is your own feet. Most people just walk everywhere. You won’t need a car if you live in the city center. Bikes are being increasingly used, although not much yet. Many people live in Alcala, but work in Madrid: they walk to the bus or the train station every day. Some may use urban buses to go there. How much does it cost to live in Alcala de Henares? Living in Alcala is cheaper than living in bigger cities of Spain, for example Madrid. We calculated how much can you expect to expend while living in Alcala de Henares in this post. Tipping is not common in Spain: we never leave a tip just for a drink or a ‘menu del día’. Sometimes we leave a bit of the change after paying the bill in a mid-price or expensive restaurant, but we will never dig into our pockets to get money out just to leave it as a tip. Just save your money. 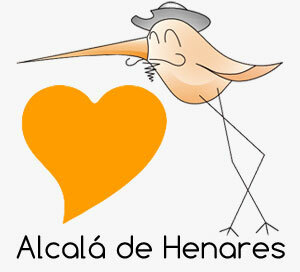 What are the people in Alcala de Henares like? Spaniards in general are a very friendly, warm and fun-loving people. People are very proud of their history and culture and are very happy when foreigners take an interest. Family life is very important for most people. Socializing and enjoying life is essential. We need little excuse for party or a fiesta. Alcala is full of student life: plenty of young people studying in the University of Alcala de Henares , many new Erasmus and exchange students every Semester, and even more international students learning Spanish in the city. The average English skills of the people in Alcala’ are … none. You may be lucky and find someone who speaks Spanglish. Alcala de Henares is a safe city, even at night. Most girls go back home alone after party no matter what time of night it is. (Even though the chance of being the victim of crime is low, use your common sense). Most Alcalaínos are proud of their University and the fact that Alcala is a city, while Madrid is not. Click here and here to know why. Don’t ever ever say that Alcala was important because of being close to Madrid, it is simply not true. Since we are ‘alcalaínos’, we felt the need of explaining this fact ‘briefly’ in this post. Take a relaxing walk around the city center (these are the must-see places in Alcala) and have some tapas afterwards (these are the best tapas in Alcala). That is what life in Alcala looks like. 5 Responses to What is it like to live in Alcala de Henares? Como puedo trabajar en Alcalán? Me encanta esta ciudad y quiero movarme aquí con mi novio. Nosotros de los Estados Unidos. Gracias! Hola! Es complicado encontrar un trabajo aquí incluso para los Españoles. Te aconsejamos que intentes contactar con alguna empresa desde Estados Unidos para solucionar todos los problemas que puede ocasionar el visado antes de venir a España. ¡Mucha suerte con la búsqueda!